I downloaded this one of those times Hoopla told me I still had downloads left that month and I felt compelled to use them. I have enjoyed previous books by Pema Chödrön, particularly When Things Fall Apart: Heart Advice for Difficult Times. This interested me because it was narrated by her. Well, that's what I thought but in actuality this originated in audio, a series of teachings she gave at Grace Cathedral in San Francisco during a program held in 2004. I understand they have been transcribed into a printed form as well, but I'm not sure I would recommend that. Even the audio could have used considerable editing. Even though she must have prepared the talks ahead of time, there are a lot of ums, and the fourth talk seems to include a guided meditation and silent meditation period but the time for this is not included in the recording. Still the content is good and I might seek out a longer text by the author on similar topics to dig deeper. It had a nice intersection with the MBSR class I just completed, about non-reacting, recognizing our own aggression, etc. Practicing Peace was previously published under the title, Practicing Peace in Times of War. I did not know this when I started reading this tiny beauty of a book, but as I've read the previous title, it soon became apparent, because I have memorized much of it! Each time I read it, I am always reminded of one of Yogi Bhajan's mantras on peace, that I know by heart, "Peace unto me, Peace within me, Peace in my mind, Peace in my surroundings, Peace to all, Peace to the Universe. May there be peace in the world. May there be peace all over the world, forever." That's the powerful lesson of this little book. Pema Chödrön wasn't always Pema Chödrön. She embraced Buddhism and her Buddhist name after living as a married woman and school teacher. When her husband announced he wanted a divorce, she flew into rage and grief. But that led to a search for a better way to live. She is now an honored author, Buddhist nun, and teacher.This short, small book about practicing peace is based on her human experience, and the reactions and human traits we all share.Many points of wisdom here. I list here just a few.War is never going to end as long as our hearts are hardened against each other.Clobbering people with your peace sign? The next time you get angry, check out your righteous indignation, check out your fundamentalism that supports your hatred of this person...Whenever there's that sting of pain, I practice pausing, because I know that that moment is precious.There is a practice we can do right then to help us stay present and awake. It is called compassionate abiding. Compassionate abiding provides a way to no longer invest in reactions with so much absolute truth. One of the 12-step program slogans is "fake it til you make it." I think that's my approach with Pema Chodron and my ongoing quest to become more centered and sane. This is the third or fourth book I've ready by her (thankfully, she has many more) and I have not even attempted to establish any kind of meditation practice. Still, the way she frames her ideas and Buddhist concepts makes me reexamine my habitual approaches and patterns of thinking and reacting. There is no end game here. Just reading her invaluable words, for now, is enough. This is a series of four talks given by American Buddhist nun Pema Chödrön at Grace Cathedral in San Francisco during a program held in 2004. The fundamental takeaway is one that will not be at all surprising to Buddhist practitioners or those familiar with the teachings, but might be unexpected to others: not only is working with one's own mental/psychological/emotional aggression a necessary prerequisite for bringing about peace in a war-torn world, but is in fact one and the same undertaking. The tenor of tension on the world stage that Pema alludes to in these talks back in 2004 is just as present now (and she did presciently note at the time that things were only getting worse! ), making these talks not only timeless, but growing in importance. 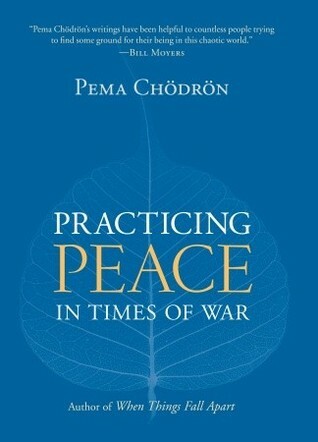 The onus of practicing this very personal development of peace in times of global war or near-war is on each and every one of us, and is utterly essential.Reading any of Pema Chödrön's works always manages to convey her warmth, humor, and down-to-earthiness, but I recommend that readers also try sometimes listening to her talks in their raw form as delivered by her, before they are transcribed into book form. (The vast majority of Pema's books are based on her live talks/programs.) Besides just the (not at all inconsequential!) joy of hearing her spontaneously speak her own words in front of an audience, Pema's talks also quite often include guided meditations, which are much easier to follow in an audio format.That being said, I am not sure that this particular title is one that's necessarily better in audio form. The first three talks are great, but the fourth and final one – the one that includes the guided meditation – feels kind of oddly and choppily edited, especially during the guided meditation part. I'm not sure if some of the audio has been spliced in from an otherwise-unheard question and answer session or what, but the guided meditation section definitely feels incomplete, a bit disjointed, and poorly delimited at the end. Although I did not read the book to compare it to the audio CD version, perhaps this is one of those times I'd recommend you read the book instead of listen to the audio. This is a vital topic for our times, when we are increasingly fighting more and more wars on every front – from the international to the interpersonal. I can basically bottom line this book for you in two words: "Cool it".The message is, of course, more nuanced and well explained than that. It was very interesting to read about what is basically an anger management technique from a Buddhist point of view. Chodron does a good job of using examples to express her points and illustrates well why this is something you should care about working on.The only real complaint I would have is that this book is not very well written. It is obvious that she is a monk first and a scholar second. The layout sort of obfuscates her point at times and she goes back over the same material multiple times because of it. The message of the book is still worth getting, but you have to sort of work at it.I will definitely think about her points and ideas the next time I get angry, so she has achieved her goal. This book has an excellent message. The idea of accepting fear, anger, and pain in order to master them as aspects of your being is nothing new, but Chodron offers some simple methods to achieve the inner peace promised by Buddhism and other such religions. My issue with this book, like every other "new-wave" book I've read lately is that it is horribly written. The only reason I was able to make it through the book is because it is so short, were it longer I would have probably found it too frustrating. Run on sentences, repetitive statements, and awkward phrasing plague the book, but luckily it's goal is admirable enough to look past it's shortcomings. At 100 pages it's definitely worth a read. This book was a gift from a good friend of Louise's. It's written by an American Buddhist nun in the Tibetan 'lineage' of Chogyam Trungpa.The message is fairly simple. When we have an emotional reaction - what she calls 'getting hooked' (shenpa), if we can have what she calls the 'courage to wait' and experience the feelings without immediately acting, we can develop a better understanding of ourselves and more compassion for others struggling with similar experiences. This reduces personal aggression and, in the aggregate, global aggression.I think this could be personally useful. The challenge will be remembering to wait - and breathe - when fully immersed in the distractions of everyday life! This short book presents the essence of Western Buddhism techniques for dealing with personal growth issues. It shares much in common with the book "Radical Acceptance" by Tara Brach but it is much more direct and to the point. It takes a head on approach to dealing with one's own anger. An effective reading of this book demands courage on the reader's part, a willingness to see yourself for who you really are rather than who you wished you were. The application of such self-honesty is rewarded by an increased ability to control your own thoughts and emotions to become a calmer, more content person. A short (100 pages) reminder that peace on a societal scale begins with a sense of peace within ourselves. The teaching here, however, is not to find some state of inner bliss. Instead, it's about getting comfortable with suffering, with uncertainty, and with insecurity. This book offers a gentle instruction on how to stay with those things that make us uneasy so that we can build up a sense of compassion for ourselves, then extend that to others, who are also invariably dealing with their own demons. It's a brief teaching, but Pema gets right to the heart of it, with warmth, empathy, and humor. This is a worthwhile read, even if it's not always 100% gripping. The central arguments revolve around the cycle of aggression starting in our minds, and therefore the path away from aggression also starts in our mind. There are some very lovely passages to this effect, with precise language and specific suggestions on how to reduce all forms of aggression (anger, jealousy, guilt, blame, anxiety...) in our lives. In any case, it is only 100 pages long and definitely worth reading. It's primary message that aggression cannot be stopped by the application of more aggression is something that we all need to be reminded of again and again. This book makes a lot of sense whether you are a buddhist or not. It's well written and full of great advice for establishing an inner peace that can transform the world around you. This is a book that I will probably reflect on many times for the rest of my life. If you are unsatisfied with the way the world seems to be spiraling out of control right now this book may be the right tool for you to begin to find the courage to cutlivate real lasting peace. You can read it in an hour or less! That means you could be changing the whole world by dinner! Go now! this book was phenomenal, a true MUST READ for any human! the beauty of pema is that she is such a clear channel for wisdom and truth... and yet remains humble and human at all times. the book is light-hearted (for such a difficult topic as working skillfully and mindfully with one's own anger and the anger/violence all around us-- this is no small feat!) and very practical at the same time. i found it immensely helpful in cultivating deeper compassion for myself and everyone on the planet right now. This slim book contains some real gems of wisdom about managing conflict and negative emotions on an individual level, which can contribute to larger conflicts between peoples and nations. I have already found the simple techniques in this book--of pausing and noticing but not being consumed by negative reactions--to be very helpful in responding more peacefully to such everyday frustations in my life as inconsiderate behavior on a crowded bus. If everyone were to take to heart the teachings in this book, the world would be a better place. One may think that to stop war one needs armies, and deterrents, and treaties, and boundaries. This book teaches that if you can recognize the warring inside of the self, if you can recognize habits of aggression, and open yourself up to the world surrounding you instead of wrapping yourself up in armor and justification, then you could realize the peaceful world that most people say they want. This book is excellent, brief, and thought provoking. Reading it made me think deeply about my life. Pema Chödrön is my life guru. Her lessons on Buddhism are so valuable to me, and this short volume (a birthday present from my wife) was the perfect thing I needed to read (and reread!) In under 100 pages, Chödrön gives some of her most accessible advice on not "getting hooked" on shenpa and being a being of compassion to those around me, especially in situations of stress and "war. "Thank you, Jill. This little book was based on talks edited by Sandy Boucher. Handy little book to have table-side to read a chapter of as the mood hits. Good chapters on patience and breathing. Nothing shatteringly new, but always good to be reminded that one person at a time changing themselves can change the world. This takes only an hour or two to finish, so I think it'll be worth your time even if you don't like it that much. I loved it, but that may be because I felt ready to hear it. It clearly articulated some unformed thoughts I've already been having. It is good if you are feeling a lot of strife in your life and need a way to deal with it that is not negative or self destructive.